Luiz Felipe Scolari appears to have ruled himself out of taking over as England coach after the World Cup. His decision, which he said stemmed from media pressure, has led to severe criticism of the Football Association's handling of the search for a new coach. Scolari said: "The English FA is going to choose a name. My name isn't one of them because I'm closing this matter." The Brazilian, the coach of Portugal, said he had been shocked by intrusion into his life by the English media. "There are 20 reporters outside my house now," said Scolari, who had been strongly tipped in this week's media to become Sven-Goran Eriksson's successor. "If that is part of another culture, it is not part of my culture. I am not the coach, and will not be (England's) coach. "I don't want this situation involving England because in two days during which I was not coach, I never agreed to anything, my life was invaded. My privacy was totally under siege." Scolari added that the press had made "absurd comparisons" of him and his wife with Eriksson and the Swede's partner, and how they dressed, adding: "That's not part of my life and its never going to be." He said he was "very pleased" the FA had considered him, but added: "Definitely at this time I want to draw a line under this matter." The 57-year-old's contract with Portugal expires on 31 July and he has a gentleman's agreement not to commit himself to another job until his current deal runs out. BBC Radio Five Live's football correspondent Jonathan Legard said the principal reason for Scolari apparently withdrawing his candidacy was because his family had received death threats, although the Brazilian made no reference to this at the news conference. Legard said the threats were believed to have originated in Portugal. The Football Association has reacted by saying it would "reflect" on Scolari's statement before making any further comment. But it revealed that the Brazilian had contacted the FA ahead of his announcement to tell the organising body he was pulling out. "Luiz Felipe Scolari this afternoon made the FA aware of his intention to release a statement regarding the England head coach position," said a statement on the FA website. "It is no secret that Mr Scolari is one of the candidates that the FA has spoken to as part of the recruitment process. "We will now reflect on his announcement before making any further comment as we move forward with the process." What do you think of Scolari's apparent change of mind? After making his statement, Scolari was seen posing with a Portugal scarf at a function outside what will be the team's hotel for this summer's tournament. 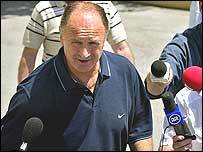 "I am committed to the Portuguese FA until the end of the World Cup and maybe longer," Scolari said. Gilberto Madail, the president of the Portuguese FA, said he hopes that Scolari now signs a new contract as Portugal coach. Madail told BBC Radio Five Live: "There was no proposal from us. It was his own decision and of course we are happy about it. "But I have always told Scolari that we would like very much to keep him. I think his decision has something to do with his sentimental connection with Portugal. "When someone has the opportunity that he has with England and refuses it then we have an obligation to try to keep him - and it's not an obligation - we want to do it. We are going to try to keep him, at least until Euro 2008. "After his decision today he is very popular in Portugal and Portuguese people would be very happy to have him for another two years at least." Who is the real Scolari?